Dr. Stephen Dantzig’s tenth book is by far his most personal to date. 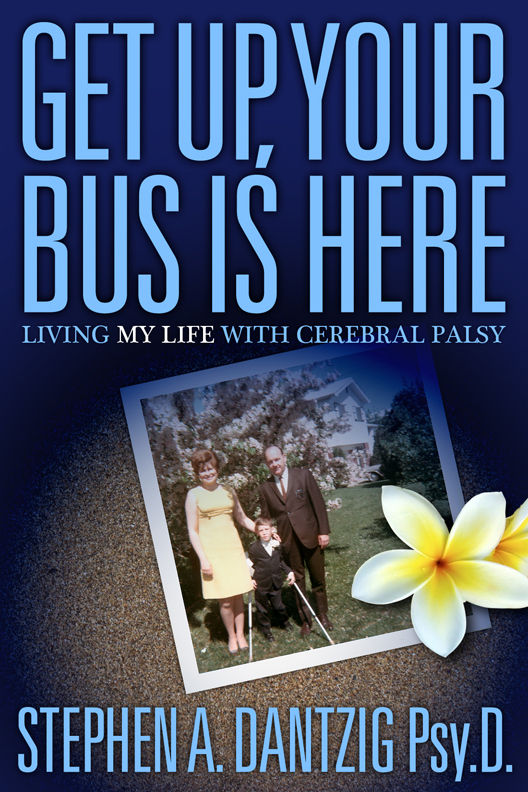 “Get Up, Your Bus Is Here” Living MY Life With Cerebral Palsy: Trials, Tribulations and Triumphs chronicles his life growing up with Cerebral Palsy and details his successes as well as his struggles. He candidly talks about additional challenges brought on by Kienbock’s Disease and the two wrist fusion surgeries that followed. Battles with obsessive-compulsive tendencies are also brought to the forefront. Dantzig talks about his parents and their influence on his independence, modifications needed in his early days in elementary school and follows his educational career through earning his doctorate in psychology from Rutgers University. He details his development and life lessons learned as a school psychologist working with severely disabled children, professional photographer, and author. He talks about living with a ghost in New York, life in Los Angeles, and his big move to Hawaii. Dantzig relates his experiences on skis, the softball field, a surfboard, and under water with SCUBA gear. His stories are often poignant with subtle humor. His struggles are discussed in a matter-of-fact way that denounces self-pity while his triumphs are talked about with humility. Dantzig provides resources and references for anyone looking for more information on the many topics discussed.